Topics about the Cassandra database. How are write requests accomplished? How write requests work when using multiple datacenters. A description about Cassandra's storage structure and engine. Understanding how Cassandra stores data. How are consistent read and write operations handled? An introduction to how Cassandra extends eventual consistency with tunable consistency to vary the consistency of data read and written. How are Cassandra transactions different from RDBMS transactions? A description about lightweight transactions and when to use them. How do I discover consistency level performance? Use tracing to discover what the consistency level is currently set to, and how it affects performance. Consistency levels in Cassandra can be configured to manage availability versus data accuracy. Serial consistency levels in Cassandra can be configured to manage lightweight transaction isolation. The three types of read requests that a coordinator node can send to a replica. In multiple datacenter deployments, Cassandra optimizes write performance by choosing one coordinator node. 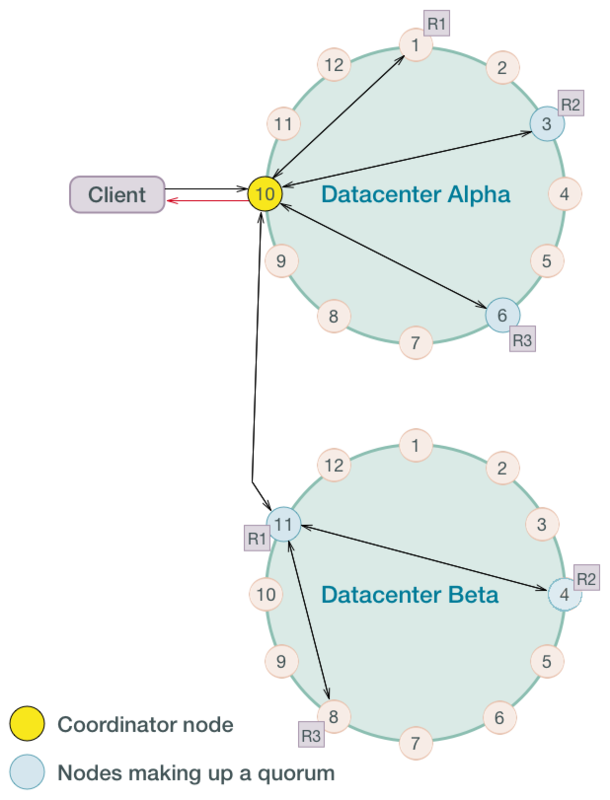 The coordinator node contacted by the client application forwards the write request to one replica in each of the other datacenters, with a special tag to forward the write to the other local replicas. If the write consistency level is LOCAL_ONE or LOCAL_QUORUM, only the nodes in the same datacenter as the coordinator node must respond to the client request in order for the request to succeed. Use either LOCAL_ONE or LOCAL_QUORUM to reduce geographical latency lessen the impact on client write request response times.